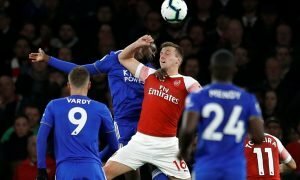 Leicester striker being chased by Europe's finest | The Transfer Tavern | Where football transfer rumours fly or die! Leicester City fans drinking this evening in The Transfer Tavern are discussing reports regarding their star striker. The Independent is reporting that both Real Madrid and Barcelona were to send representatives to Spain’s game against England tonight to watch Jamie Vardy. Unfortunately for Vardy though he has picked up an injury which see’s him miss out on a guaranteed start this evening, with England boss Roy Hodgson deciding to rest England’s leading all time goalscorer Wayne Rooney for the game. 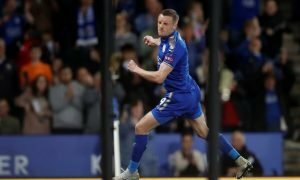 Vardy who has hit 12 goals for Leicester so far this season will be disappointed not to be able to show his talent against one of Europe’s elite football nations. The Leicester strikers contract at The King Power Stadium expires at the end of the current season, and with his fine performances so far this term he seems to be attracting a number of clubs, with his eye for goal and one hundred per cent work rate. Those Leicester fans in The Transfer Tavern are disappointed that an injury has scuppered their players chances of a rare start for England, but are happy that his non appearance will keep the scouts away for now.